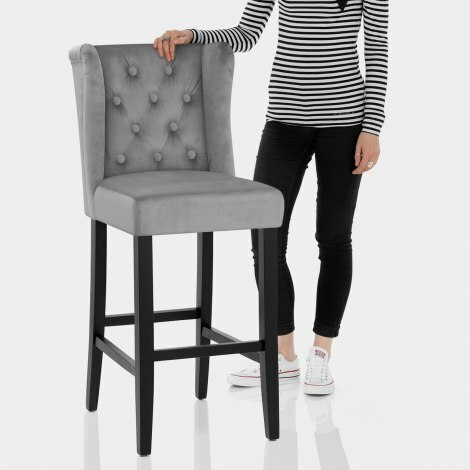 The Pemberley Bar Stool Grey Velvet fuses a classic design with chic contemporary style. Boasting a host of decorative details, the Pemberley Bar Stool is an elegant four-legged design that will add sophisticated style to your home bar area or kitchen. Plush grey velvet fabric covers the comfortably padded seat, and the backrest has a winged design with a quilted button pattern for a fashionable touch. Strength and stability is ensured with a fixed height frame crafted from solid wood, and bracing bars work to reinforce the structure whilst doubling as a footrest. Complete with a silky black satin finish, the legs each have a protective plug on the underside to help preserve floor surfaces, making the Pemberley an ideal choice for the kitchen. "Great quality and a good price"